Communities In Schools of Wilkes County – Alexander County Branch (CIS) is excited to celebrate our growing area partnerships! The Bojangles of Taylorsville and Bethlehem generously donated a portion of their proceeds to our organization during two recent Share Nights. During a Share Night, ten percent of the profits made between the hours of 5:00 pm and 8:00 pm are filtered back to the receiving organization — in this case, CIS! Pictured here are managers Jeremy Pope, Nathan Annas, and Jason Gregg from the Bethlehem store, following the Share Night of March 19th. Our most recent night was last Tuesday, April 23rd. Please check this blog and our Facebook page often for news of more opportunities in which to contribute to the nation’s leading dropout prevention program! And from all of us at CIS to the staff of Bojangles and everyone who came out to show support, thank you! The end of the school year is rapidly approaching us here in Wilkes County. With school officially being out of session come the end of May, it is no surprise that the turn of the month is one heralded by parent and student alike. As if to celebrate the start of this final countdown comes a highly-anticipated and greatly loved event for area citizens — Merlefest 2013. 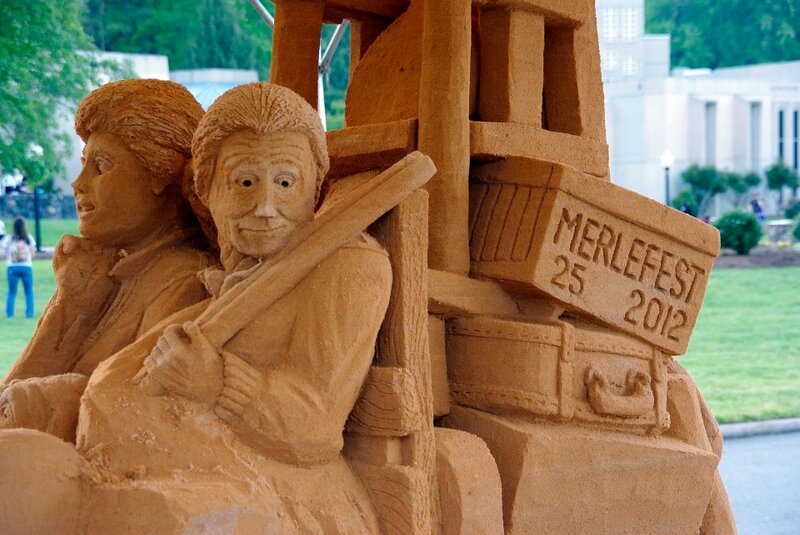 Held April 25th though the 28th, Merlefest 2013 marks the 25th year of the music and arts festival, and will be featuring some big names! This year’s line up of artists include: The Avett Brothers, Matracca Berg, Sam Bush, John Cowan, The Charlie Daniels Band, Delta Rae and many, many more! Pay us a visit during your trip to the festival — and support Communities In Schools and your area students as well as your local community college! They say all good things must come to an end — a saying we felt here at Communities In Schools last week as we said goodbye to five long-withstanding board members. On Thursday, March 14th, 2013 — CIS honored Brenda Sales, Linda Zinger, Matt Daye, Sheneele Wagoner, and Scott Perry with a small luncheon, enjoying some great food, fun, and fellowship as we said goodbye. The meal was catered by Tim Adams. Along with some laughter, some tears, some silly hats and a sillier song — we took the time to honor each of these outstanding citizens for their hard work and dedication over the years. Read on to find out more about each of them — and see what “honorary title” they were given during our shenanigans. Linda Zinger, a realtor for Carolina Realty has served since 2005. Acting as vice-chair during her tenure here, she has volunteered not only time on the board, but as a mentor in both the Friends of Youth and Lunch Buddy programs. She has gone above and beyond, even contributing a portion of profit from her realty sales with a program called Lots for Learning. She is due the title of best all-around, though “Best Straight Up and Down” was much more fitting for her physique. Sheneele Wagoner has been with us since 2001. She works as a lead instructor at Wilkes Community College, and has volunteered time not only as secretary of our board, but within the New Century Scholar steering committee as well. With a full-time job, her family, and going to school for a doctorate — we have been awestruck at her dedication to our programs at CIS. Therefore, Sheneele was given the “Most Scholarly Award” as we said our farewell. In all seriousness, we here at Communities In Schools would like to extend our gratitude out once again to all of these former board members. It has been through your help and dedication that we have been able to reach and impact our local students. We thank you for taking the time and making the difference in their lives. Earlier this month, faculty and staff of West Alexander Middle School were treated to a special bullying prevention training session provided by Communities In Schools – Alexander County Branch. Held Wednesday, March 6th, those in attendance welcomed William “Billy” Lassiter of the Department of Public Safety, Division of Juvenile Justice — who provided this professional development training. Bullying is a severe problem in the United States. Daily, 160,000 students miss school for fear of bullying. Sadly, with cyber bullying ever on the rise, this decision can offer little escape to those affected – so knowledge, prevention, and action within the school setting is key. The training consisted of defining bullying, exploring the causes of bullying, and looking for new ways to deal with bullying — all of which go along with the core Communities In Schools basic: a safe place to learn and grow. It is our mission to provide our students with the best opportunities and environments for success — and we thank Mr. Lassiter for his time and efforts helping us make this vision a reality. For more information about CIS – Alexander Co. Branch, please contact Angie Yates at 828-409-0231. As our Headed to College race draws ever nearer, you may find yourself wondering about the program it benefits: The New Century Scholars. We know that these last-dollar guarantee scholarship recipients are required to offer ten hours of community service per year — a chance to give back in their own neighborhoods and school systems. But what exact sorts of volunteerism do they participate in? On Saturday, January 12th, participating students volunteered at the Wilkes County Special Olympics Basketball Tournament. This event was held from 8:00-4:00 at the North Wilkes High School and North Wilkes Middle School gyms. During the event, New Century Scholars helped keep score of the games — but spent time cheering on participants as well! 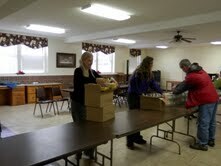 They also worked to help distribute lunch, then participated in clean up following. We here at Communities In Schools of Wilkes County find no shortage of things we enjoy about the activism of our Scholars. Be it the chance to interact and engage with those from all walks of life, the chance to grow and explore, or the chance to learn the value of hard work — we value it all! However, we enjoyed a little something extra with this event. What was it, you may ask? The smiles on the faces of the tournament participants, of course! Are you ready for the ultimate challenge? 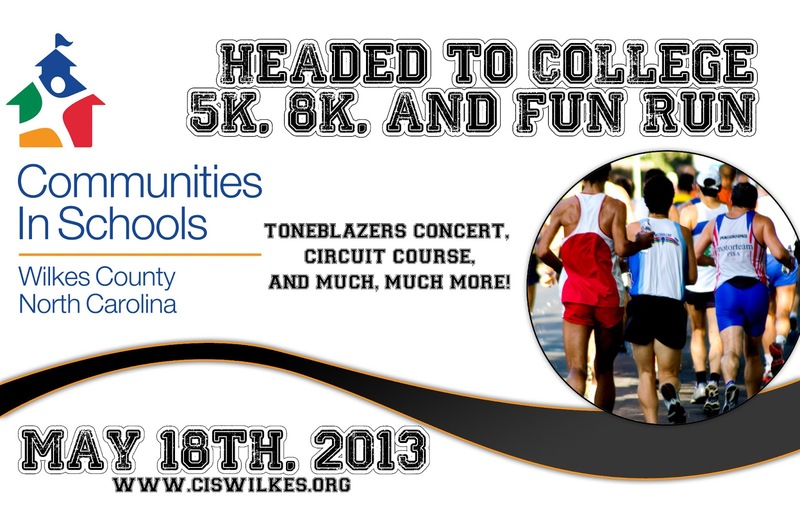 Come join us this May for the 10th annual Headed to College Race for Communities In Schools! Featuring a 5k, 8k, 1 Mile Fun Run, and Uphill Battle, we offer a little something for everyone! Whether you’re just getting started in the realm of fitness or you’re a certified enthusiast — join us May 17th and 18th for fun, fellowship, and a good run! Click here to find out more about our New Century Scholar program, the beneficiary of funds generated in the race. Find a current list of race sponsors — alongside level pricing and contact information for those interested! From water stations to a circuit course, Communities In Schools hopes to offer it all in this unique and philanthropic endeavor! We’re celebrating a big birthday this year (double digits!) and decided it was time to celebrate! Browse this page for information on what’s new, and don’t forget to join the party! Come here to find stories about how Communities In Schools is making an awesome impact in your area! Everyone can benefit from words from the wise every now and then, so venture over this way to read up! this board for some uplifting words and images of encouragement. From our archives to our present, this is the place to check for what’s going on in the world of CIS! Again, we’re very excited to be a part of the ever booming Pinterest world — please make the journey over and follow us! area students enrolled in the program. 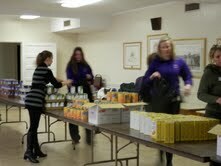 access to a food pantry located on campus. “The staff members from Wilkes were a huge help. or contact Angie Yates by email, or at 828-495-4611.